Croatia’s IPRI score increased by 0.417 to 5.171 placing it 13th in the Central Eastern Europe and Central Asia region and 73rd in the world. Croatia is classified by the IMF as part of the Emerging and Developing Europe group and by the World Bank as High income country. Croatia’s Legal and Political Subindex increased by 0.092 to 5.242 with scores of 3.154 in Judicial Independence, 5.873 in Rule of Law, 6.553 in Political Stability, and 5.388 in Control of Corruption. Croatia’s Physical Property Rights Subindex increased by 1.135 to 5.484 with scores of 4.383 in perception of Property Rights Protection, 7.994 in Registering Property, and 4.075 in Ease of Access to Loans. 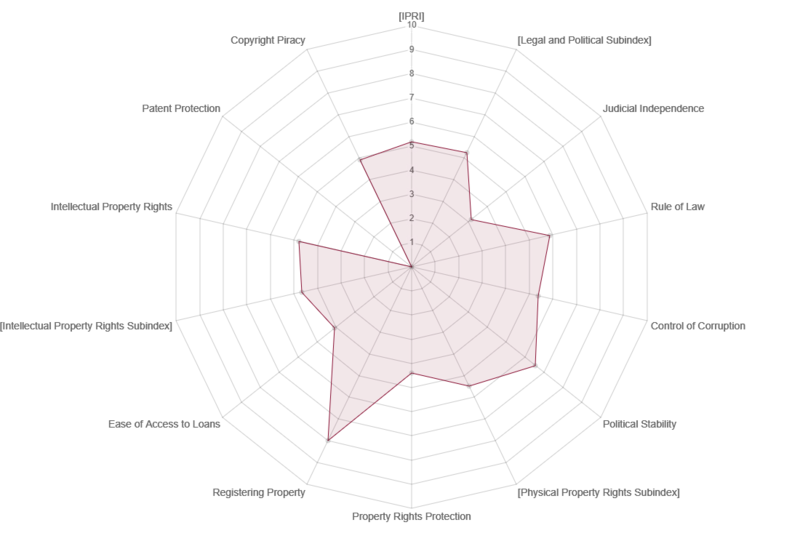 Croatia’s Intellectual Property Rights Subindex increased by 0.025 to 4.788 with scores of 4.677 in perception of Intellectual Property Protection, data wasn't available to measure Patent Protection, and 4.9 in Copyright Protection.